The 2019 Jeep Cherokee gets more conventional styling this year and adds a powerful turbo-4 engine. It retains its off-road prowess, especially in the Trailhawk model, and it’s comfortable on pavement too. Interior room is an issue even though interior materials are not. Crash-test results are less than stellar, though Jeep makes plenty of active safety features available. In addition to Trailhawk, Jeep offers the Cherokee in Latitude, Latitude Plus, Limited, and Overland trims. We rate it a 6.2 out of 10. (Read more about how we rate cars.) 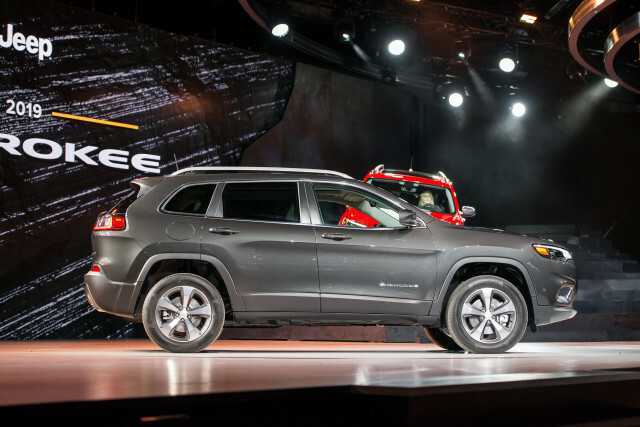 The Cherokee made its debut for the 2014 model year and it is updated for 2019 with new styling, a new engine, an updated infotainment system, and revised transmission and suspension tuning. 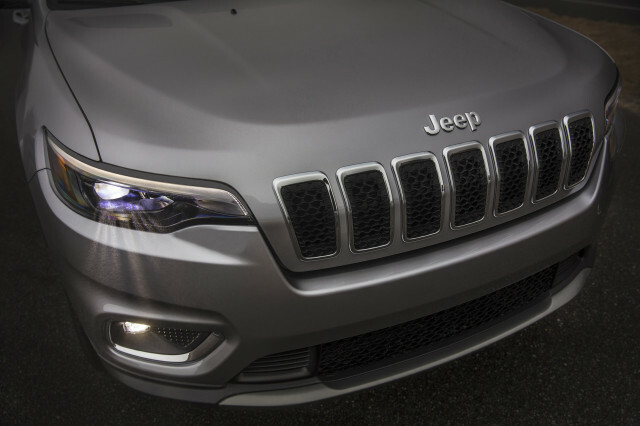 The Cherokee’s new looks do away with the oddball six-eyed look of the previous model and bring the lighting together where it’s supposed to be. The headlights are now LEDs with integrated daytime running lights, and fog lights are located below. The front end is just different enough from the Grand Cherokee to look distinct, but the family resemblance is obvious. The rest of the body is rather generic, however. Inside, the Cherokee is attractive and functional but lacks the space of rivals. The interior color choices are named after exotic locations, and Jeep updated the infotainment system with faster processors, a larger 7.0-inch touchscreen on base models, and standard Apple CarPlay and Android Auto. The rear seat moves forward and back up to six inches, but moving it fully back cuts into an already small cargo area. Jeep carved out a little extra space back there by widening the cargo hold, but at 54.9 cubic feet with the rear seats down, it’s at least 15 cubic feet smaller than roomier competitors. The Cherokee also isn’t as wide as some rivals, so occupants won’t have as much elbow room. Under the hood, Jeep added a new 2.0-liter turbo-4 engine that makes 270 horsepower and 295 pound-feet of torque. It’s the fastest Cherokee and quicker than the 271-hp 3.2-liter V-6. The base engine is a rather weak 2.4-liter 4-cylinder. All three are mated to a 9-speed automatic that is less troublesome this year. The V-6 can tow up to 4,500 pounds and the new turbo-4 can pull 4,000 pounds. New suspension tuning makes the Cherokee slightly smoother on the road, and the handling remains controlled but far from sporty. With three all-wheel-drive systems, no competitor offers the off-road prowess of the Cherokee. That’s especially true in the Trailhawk model that adds knobbier tires, additional ground clearance, improved approach and departure angles, and skid plates. All AWD Cherokees also have a Selec-Terrain system to deal with tough surfaces. Jeep offers two types of low-range gearing to handle climbing and hill descent duties as well. While crash-test scores are less than ideal, Jeep offers many active safety features. The amenities list is long, too, with things like nappa leather, a heated steering wheel, ventilated front seats, and a configurable LED gauge screen. The funky, separated lighting that gave the Cherokee a sleepy face is gone. The daytime running lights are now part of the headlights, which are now standard LEDs that sit where headlights should. Fog lights are standard and they sit in the lower corners of the front fascia. The seven-slat grille is still angled, but the look is much more pleasing than it had been. As for the rest of the body, the Cherokee could be any other crossover SUV from the from the headlights back. It’s almost overly conventional, though the Trailhawk stands out with its blacked-out bumpers and wheel flares, as well as its black hood insert. Those bumpers are also reshaped for an underbite that improves the approach and departure angles. Inside, the Cherokee is fashionable and more car-like than rugged. There are plenty of plastics but also more soft-touch surfaces than expected. Jeep names colors after exotic places such as Morocco or Mount Kilimanjaro. Easter Eggs such as an old-school set of Jeeps in the park-assist screen and an etched Jeep in the base of the windshield glass, where it appears to be driving through Arches National Park, show off Jeep’s sense of humor. The base 2.4-liter 4-cylinder produces 180 hp and 171 lb-ft of torque, while the next step up is a 3.2-liter V-6 that makes 271 hp and 239 lb-ft of torque and comes standard in some models. New this year is a 2.0-liter turbo-4 that spins out 270 hp and 295 lb-ft of twist, and is offered as a premium engine on all but the base model. The base engine will serve most commuters just adequately. It moves the Cherokee from 0-60 mph in a leisurely 10.5 seconds, though it feels stronger with front-wheel drive. The 0-60 time drops to 7.5 seconds with the V-6, and the refinement improves. It gets even better with the turbo-4. The 0-60 time falls to 7.0 seconds and the additional torque makes this the engine of choice for the toughest off-roading situations. All engines come with stop/start, but fuel economy isn’t a strong point for any of them. They are all also mated to a problematic 9-speed automatic. This transmission has suffered from jerky gear changes and delayed upshifts and downshifts, but Jeep has re-tuned it this year. Instead of aiming for fuel economy, engineers are now going for drivability. That means the transmission won’t try to upshift so quickly, and fewer shifts mean power is more readily available. On the road, the 9-speed is improved. It doesn’t search for gears as often, but it isn’t nearly as responsive as the new 9-speed that General Motors is using in vehicles like the Buick Regal and Chevrolet Equinox. One way to make the transmission better is to use the Selec-Terrain system’s Sport mode, which holds gears longer, splits the torque 40/60 front to rear, and tops out in seventh gear on the highway. We’d also like to see steering wheel shift paddles. Jeep has updated the suspension for 2019 and tweaked the springs, dampers, roll bars, and bushings for a slightly smoother ride. The ride was already fairly smooth, and the changes only make it more comfortable, especially in the Trailhawk with its taller tires. The suspension tweaks do nothing to improve the rather uncommunicative but perfectly competent handling. The steering offers little feedback and can be a bit too heavy, but it points the Cherokee in the right direction every time. When equipped with a V-6, the Cherokee can tow up to 4,500 pounds. The turbo-4 can tow 4,000 pounds, and the 2.4 can pull 2,000 pounds. The Cherokee offers three all-wheel drive systems and one dedicated off-road-oriented model. The base AWD system is Active Drive I, which features a wet clutch and a new rear-drive module that cuts 17 pounds. It’s an automatic system that can send some power from the front to the rear wheels, and it has no low-range gearing. Active Drive II delivers a simulated low range and a crawl ratio of 51.2:1 via the automatic transmission’s low set of gears when paired with the turbo-4. Cherokees with this system can conquer two-track mudpaths, rocky surfaces, and steep hills with relative ease. Selec-Terrain helps when needed with its Snow, Sand/Mud, and Rock settings. 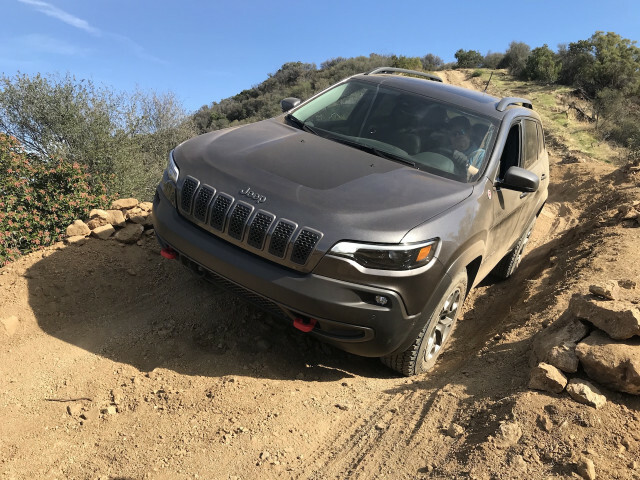 All of the modes work with various vehicle systems, including the transmission, throttle, and traction control, to help the Cherokee deal with various types of terrain. Active Drive II also can declutch the rear axle to conserve fuel. Active-Drive Lock comes with a true two-speed transfer case and an electronically activated mechanical rear differential lock. That lock ensures that both tires on the rear axle are churning no matter the surface. The Cherokee Trailhawk is the choice for off-road enthusiasts. It has unique front and rear bumpers to improve the approach and departure angles, taller tires that raise the breakover angle, skid plates, and red tow hooks. It also comes with Selec-Speed control, which works like a low-speed cruise control for uphill or downhill runs. This system has nine settings, one for each transmission gear, between 0.6 and 9 mph. Selec-Speed is great for controlling the Cherokee’s speed through tight, technical terrain or on hills. With 8.7 inches of ground clearance, the Cherokee Trailhawk is an adventure vehicle in a class of family haulers.